A pretty cool film noir of sorts where an angry father seeks both answers and revenge for his daughter’s brutal murder on his doorstep. A pretty cool film noir of sorts where an angry father seeks both answers and revenge for his Edge of Darkness is a gritty, dark thriller that holds no punches and moves in a straight direction from one point to another. It’s a mystery with a hero cop going after the person or people who killed his daughter. It seems like we’ve seen this movie before. Or wanted to see this movie before, but constantly been disappointed with the results. Vin Diesel in A Man Apart, Denzel Washington in Man on Fire, Harrison Ford in Frantic. These movies are always let downs. 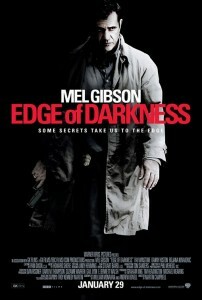 Well, Edge of Darkness is the one we’ve been waiting for. It’s the one that gets it right. Finally! The movie begins with Mel Gibson’s daughter coming home to visit him and she’s sick. It isn’t long before she’s killed. Brutally murdered in front of him by a man with a shotgun. We’ve seen moments like this before, in Kevin Bacon’s Death Sentence or Gerard Butler’s Law Abiding Citizen. And those movies never get it right. The death scene drags on for too long and sometimes even goes to slow motion. Not this time. Director Martin Campbell (Casino Royale) handles it perfectly, making the death scene instantaneous and the all the more visceral and shocking as a result. And now Gibson is on a mission to find out why his daughter was murdered. He’s a police detective, so if anyone can do it, he can. And he slowly starts to peel back the layers of the onion, piece by piece. There are a lot of characters here, and that could have been a problem in somebody else’s hands. Going all the way back to Bogart in The Big Sleep, any mystery with too many characters can become confusing if not handled very carefully. LA Confidential was able to pull it off, and this movie is as well. The tricks are simple. Have Gibson visit, come across each character multiple times. Any character of importance gets more than one scene. He visits his daughter’s boyfriend twice, for example, each time looking for new answers. Another clever idea that Martin Campbell has working for him with this picture is to have the character played by Ray Winstone as a sort of secret cleanup guy for the government. Winstone is on Gibson’s side, but really he’s on America’s side, wanting to rid this country of the bad guys who think they can do as they please. Unfortunately, some of these people are the very same people he works for. Winstone is trying to put all the pieces together at the same time that Gibson is, and so in a sense we get different clues from following them separately. And Winstone likes Gibson. He meets with him twice and supplies Gibson with more information than he had. He likes Gibson because he’s honest, and that’s not something Winstone comes across very often in his profession. As the movie goes on, it builds in tension, just like any great thriller should. Gibson discovers more and more secrets and constantly moves from character to character learning more about who and what was involved. And each clue he finds has tons of ripple effects leading to about three more clues and answers to fill in. It’s a hell of a mystery and, bringing Gibson all the way up against the top people responsible. 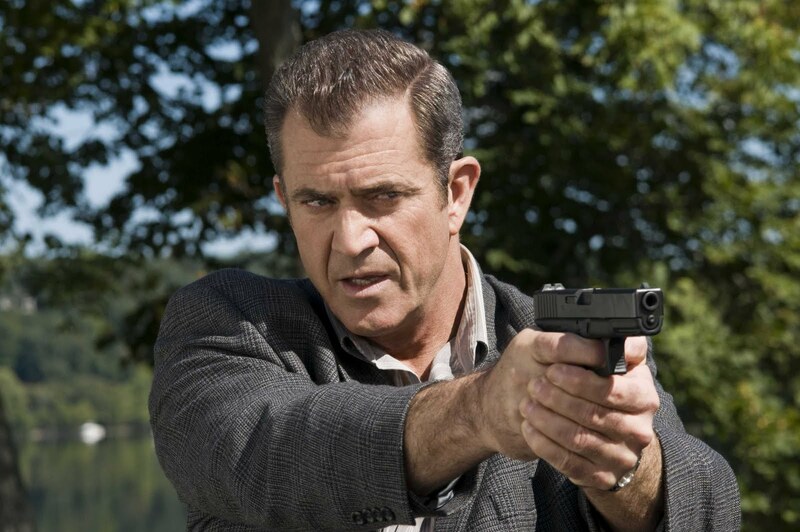 Mel Gibson may not be a nice guy in real life, but he is a good actor and this movie certainly shows it. Martin Campbell made the original version of this film for the BBC back in the 80s and it was critically acclaimed and talked about for years afterward. Now he has taken up the reins again to helm the American version and again he has found success. This is one smart director. There have been so many vengeance thrillers and so many of them get it wrong. There are just so many land mines to avoid that more often than not a movie lands in one of them or more than one of them. Taken was one of the few others that got it right. That’s the best action version of a vengeance thriller. Edge of Darkness, on the other hand, is the best mystery version of a vengeance thriller.